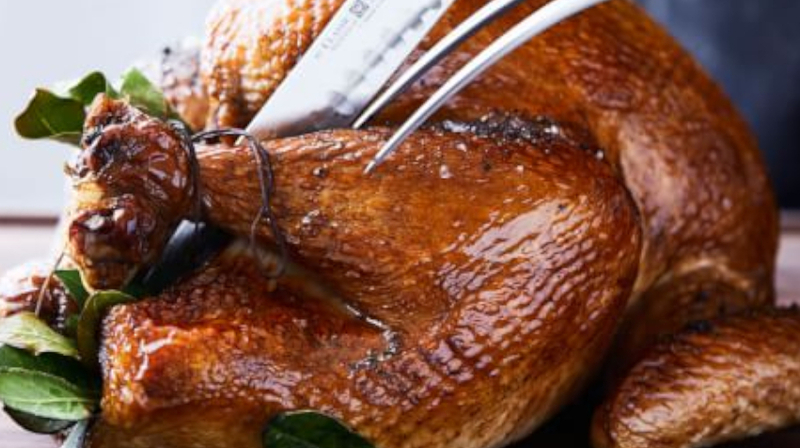 The turkey is often the main course of the Thanksgiving holidays, and we wanted to share with you one of our favorite turkey recipes, this Buttermilk-Brined Turkey. Soaking the turkey in a saltwater brine produces tender, juicy meat. In this recipe, our brine mixture also includes Arps Dairy Buttermilk, which adds flavor to the turkey and helps keep the meat incredibly moist. To make the brine, in a saucepan over high heat, combine the salt, basil, coriander, peppercorns, mustard seeds, granulated garlic and bay leaves with the water and bring to a boil, stirring occasionally, until the salt is dissolved. Remove from the heat and let cool to room temperature. In a large pot, stir together the cooled brine mixture and Arps Dairy Buttermilk. Rinse the turkey inside and out with cold water and place in a large brining bag. Carefully pour the Arps Dairy Buttermilk brine mixture into the bag. Seal the bag, pressing out the air, and place in a large stockpot or other container large enough to hold the turkey. Refrigerate for 24 to 36 hours, turning occasionally. Remove the turkey from the brine; discard the brine. Rinse the turkey inside and out with cold water and pat dry with paper towels. Trim off and discard the excess fat. Place the turkey, breast side up, on a rack in a large roasting pan. Rub the skin evenly with the butter. Truss the turkey as desired using kitchen twine. Let the turkey stand at room temperature for 1 hour. Position a rack in the lower third of an oven and preheat to 400°F (200°C). Roast the turkey for 30 minutes. Reduce the oven temperature to 325ºF (165°C) and continue roasting, basting every 30 minutes with the pan juices. If the breast begins to cook too quickly, tent it loosely with aluminum foil. After about 2 hours of total roasting time, begin testing for doneness by inserting an instant-read thermometer into the thickest part of the breast and thigh, away from the bone. The breast should register 165°F (74°C) and the thigh, 175°F (79°C). The total roasting time should be 3 to 4 hours. Transfer the turkey to a carving board, cover loosely with foil and let rest for 20 to 30 minutes before carving. Serves 12 to 14.